Booing at the opera is nothing new. Audiences in continental Europe have been vocally reflecting their dislike of productions and performers for decades, even centuries. Over the past few years however, British audiences seem to have become a lot more vocal, most recently at the opening night of The Royal Opera's Idomeneo, a production which split audiences and the press, garnering polarized reviews from one to five stars. The issue was discussed by broadcaster Petroc Trelawny and writer Gavin Plumley on BBC Radio 4's PM programme. @RoyalOperaHouse Zero tolerance. Give me an instance when it isn't boorish & arrogant. Spoil your own evening: not mine or the performers. @RoyalOperaHouse @BBCRadio4 #OperaBooing It would be rude not to if the performance warranted it. Instant feedback is fine if deserved. @RoyalOperaHouse @BBCRadio4 Outrageously rude! We have excellent artists at ROH. Audience members who boo should be shown the door. @RoyalOperaHouse @BBCRadio4 surely more effective to sit in silence, and watch the tumbleweed float by? And only for the production team? @RoyalOperaHouse @BBCRadio4 The poor audience's only way to protest against "regie theatre" and it's excrescences. @RoyalOperaHouse @BBCRadio4 What I've seen a lot recently: booing at "evil" characters at curtain call. So immature & silly. What do you think of booing at the opera? Do you think opera audiences are different from the audiences of other art forms, and do you see the trend increasing or dying out? I am afraid that Kasper Holten must assume responsibility for many of the recent failures which have understandably incensed loyal patrons (and their displeasure is not just shock at the new as some commentators would simplistically have us believe). In my view, booing is an effective method of expressing displeasure at a dismal production (writing is often simply not taken to heart by the management as witnessed by the dire and inept productions which seem to keep on coming!). Despite his undoubted directing acumen, Mr Holten appears to be, I am very sorry to say, an unfortunate acquisition by the Royal Opera and should consider his position. I've been going to CG for over 30 years and am dismayed that I may not be able to face going in future if Kasper Holten continues to inflict us with his self-indulgent fantasies. I booed loudly at Maria Stuarda - wonderful singing ruined by a crass production. What a contrast with the MET! I sincerely think there are always ways to establish an opinion. Everybody is allowed to have one, we just have to remind ourselves that we're not the only ones in the theatre and even if it's to our disliking, we still need to respect the efforts put forth during a performance. In comments above, the cowardly-named "G" (ROH, why do you "require" the name of commentators if you won't enforce your own requirement?) explains how everyone is allowed to have an opinion. Indeed: people who like an aria tend to applaud in the middle of the act, at the aria's conclusion, a practice I loathe (these fans are "not the only ones in the theatre", are they?) -- but also one I tolerate, because "everybody is allowed to have an opinion". Likewise, applause at the end of a performance expresses an opinion; just as booing expresses another. Provided booing doesn't happen during the performance itself, which I'd never condone, I fail to see what the problem is. Later, G. R. Larivière makes a few irrational points: that booing prevents enjoyment of the show (if it's at the end of the show, how so? ); that singers might conflate booing the prod with booing their singing (G. R. Larivière, believe you me, singers have seen it all; they're not stupid; they know *exactly* what's going on); that you can "ask for your money back" if you didn't like the prod (really? on what planet?). There is a growing tendency to applaud everything, by default. Why? One of the members of the Twitteriat quoted in the article above talks about respect for the performers, etc. Respect has to be earned; not to say anything about subjective things such as beauty being in the eye of the beholder, etc. This "respect for the performers" trope, if extended to political and civil life, is what would have us tolerate the deeds of incompetent politicians just out of respect for their office. From a logical perspective, this isn't any different. It's interesting to look at how audience sycophancy has degenerated in a place like Amsterdam (with a fairly philistine audience, for reasons that remain mysterious to me), where *every* single performance of *anything* gets a default standing ovation *always*. Forget about booing or not booing -- in Amsterdam if you move and make a noise on stage you get a standing ovation. i would never boo a singer but a production, yes. We have to somehow show our disgust at how some producers are ridiculing opera. First, because you are preventing the people next to you, who might actually be enjoying the show, from actually enjoying the show. Second, the singers on stage being booed are not the ones who have come up with the production. Why should they get booed? If you are not enjoying the show, leave during the intermission. Ask for your money back. Hopefully, one day, opera houses will understand that the public is coming for the music and the singing, not to see how a tortures soul decided to stage an opera instead of seeking therapy. I don't think you quite get the point. The booing being discussed takes place after the performance, so there is no chance of spoiling anyone's enjoyment. Also, no one ever boos singers - and this was very evident at Covent Garden on Monday, as the singers were given a very warm reception, but the booing began as soon as the production team came out. So, if I've understood correctly, it's OK for directors to challenge the audience but we're not allowed to challenge them. And all Konzept productions are innovative and so must be treated with hushed respect. I don't see any other mechanism for audiences to respond when we're presented with half-baked productions. I stay away from ENO most of the time, which I regret, but the management is not listening to its falling audience numbers. And, for the record, I like modern productions (went to see "Einstein" twice), just not portentious rubbish. You've hit the nail on the head here - "it's OK for directors to challenge the audience but we're not allowed to challenge them." We're always talking about 'challenging' the audience in theatre - it's become a cliché in the arts profession. I've never liked the concept because it seems to embody a sort of mild hostility to the audience, a suspicion of their values and taste. I LOVE opera audiences' willingness to feedback 'on the night' whether with rapturous adulation, or booing. It's honest, it's direct. Audiences care about they see - their emotions are stirred. This is all good. Audiences have paid their money - at the end of the show it's 100% up to each individual audience member how they want to respond to the performers and creative team. I wish regular theatre could be more like opera in this respect. Well made point! It's a very lazy argument on the directors' part to say that audiences don't like something just because it was a bit different or non-traditional. Many in a typical opera audience do love modern and even experimental operas as well - when it is done with real vision and integrity, respecting the music. Isn't booing in the House all part of the instantaneous feedback ROH and other companies are so actively courting on social media? There are opera directors in vogue at the moment who are self-promoting through publicity seeking vandalism. They love to be booed because they have engendered a response in an audience and to get this flatters their egos . Like all vandals they enjoy causing a shocked reaction and like all graffiti artists they love to leave their mark for the World to see. The best response would be for an audience to applaud the real artists, the musicians and singers, but let the production team walk on and off stage to complete silence save for the sound of their own footsteps. Very difficult to get an entire audience to react in this way, but if it could only be done then maybe opera houses would get the message that taking art downhill is not moving forward. No! Arists work brutally hard at their craft. Booing those onstage is insensitive and disrespectful, even cruel. Just walk out, demand your money back if you must, but outside the hall. A comment sheet in the lobby or on twitter - after the show - could suffice too, but never during a performance. Also leave those who paid to remain in peace. My opinion is that after any performance, the audience who have paid to see it should have the opportunity to express their opinion about what they have just witnessed. This may take the form of simple applause somewhere at the middle of the scale or loud cheering or loud booing at opposite ends of the spectrum. All I would say is that it should be an honest reaction to what you have just witnessed - performers (and I have been one) and directors need honest feedback from their audiences so that they can continue to grow as artists. So booing or cheering does not disturb me as a member of the audience (except occasionally when I've felt the booing was rather malicious and that some particular audience members had turned up with the intention of booing in advance). What I do find very annoying and disrespectful, however, and it happened last night (7 November) at the ballet, is that the moment a performance has finished, a few members of the audience get up and race for the door, without applauding the artists at all, disturbing everyone else in their row, and obscuring the view of the artists on stage for other members of the audience who want to show their appreciation (or otherwise). I find this very bad manners. Just a comment on people leaving straight after a performance. This isn't necessarily because of bad manners per se, but is often because of getting to catch a train. Why don't you just commission some good productions for once? No booing - job done. It is not fear of the new, or modern, or whatever you want to call it which makes people boo, it is because the production is mediocre, poor, substandard - take your pick - and ill-befits an opera house which claims to be one of the best in the world, setting the bar high. Audiences have had to put up with a number of poor quality productions ( I am not referring to the musical aspects here) in recent seasons - Rusalka, Robert le Diable, Eugene Onegin, Parsifal, Don Giovanni, Manon Lescaut, Maria Stuarda. It does look like a trend has developed for allowing directors to make of an opera whatever they like. Is there no-one who is prepared to step in and say "No!"? Does the ROH care what its audience thinks? The new Idomeneo would seem to indicate that it doesn't. This production was booed on the first night, not because it was modern, but because it really was not very good - a misinterpretation which involved a rewrite of the story and which was a mixture of worn-out clichės (suits, leather coats, shades, rifles, etc.) and indecipherables- children in white gym kit, Jaws, accordion. Characterisation was poor - a despot king who is no more than a cipher, Ilia as flirt/tease, having to overwork her thigh through the split in her dress. The didactic style did not help and those tableaux at the end made me feel I was being kept behind for being naughty. No wonder lots of people decided to boo. The singers were well received; I suspect they were not surprised at the reception given to the directorial team. Whatever form a staging takes, it has to be coherent, accessible, hopefully insightful, leading to a greater understanding of the work, not some sort of dog's dinner or director's soapbox. Until then the booing is not going to go away. That's nothing in comparison to Calixto Bieito's staging. They both deserve boos and oot, I mean ouououout! Though I find booing rude.. I do think it might spontaneously happen from me with the ridiculous and appalling trend of "re-inventing the masters by setting classic operas in modern times, sensationalism etc. To me it is like painting a mustache on the Mona Lisa. Do Idomeneo the way Mozart intended!! I almost never go to the operas anymore here in LA due to this trend.. La Traviata in the 1920s, Cosi set in Vegas in the 70s.. Tosca in Nazi Germany .. really? Come on.. disgusting. It is debasing art in my opinion. Opera companies think they need to reinvent operas to appeal to modern audiences. I'm just having a flashback to Nathan Gunn singing in green pjs with a bird basket on his crotch, and a base ball cap and walkman with with masonic symbols... So cheap! And Nathan is an excellent singer. So sad.. So distracting! I went to to Rigoletto where the chorus looked like Italian mafia... Really? Enough said I BOOOOOO the trend. Let's get back to classic opera.. Realism... the days of Zefferelli at the Met, so historically correct in costume and sets that you are immediately drawn into the opera. It isn't just opera. When Harrison Birtwhistle's "Panic" was premiered in the Last Night of the Proms, there was respectful applause for the conductor, orchestra and solo saxophonist. Then a rather scruffy man in a scruffy suit and scruffy beard was ushered to the front. There were a few scattered boos, but what was most noticeable was that the applause almost died down, with only a few die-hards continuing to clap. It was Birtwhistle himself, he took his bow, went offstage... then the soloist came on for another bow and the applause started up again. I remember this because I was there. If it's ok for us to cheer at the end, it's ok for us to boo. If directors and opera houses set out to provoke (and that can be the only explanation for the recent Idomeneo, Vepres and Rusalka) then they can't complain if they provoke a hostile reaction. Booing has been going on for years and it really doesn't seem to have inhibited innovative, thoughtful or even downright crass productions. It's not necessarily a mindless reaction from people who aren't theatrically literate. It might be a response from people who have a deep affection for an opera that they haven't seen for 25 years and who think it's dishonest to change the plot and incompetent to be reduced to using the surtitles to tell the audience about it. I may not want to leave at half time if I'm enjoying some excellent singing. The whole point of theatre is the live engagement between performers and audience. Audiences here are very adept at identifying who gives the good performance and who doesn't. If we're paying ROH prices then I think we're entitled at the time to express our disapproval. Besides, wouldn't it be dull if all productions were safe concerts in costume and we all just sat there dutifully applauding at the end? Love Osmin's idea, even though I doubt it can ever get carried out in reality for the reasons he mentions. I have experienced more than a few directing teams literally begging for boos. It seems to be something like a hallmark of artistic success in their own closed and twisted world. I am trying to understand opera and this was only my third production. I am studying Greek and Roman Mythology and looked forward to the production. I must admit I did not enjoy the modern visual interpretation of the stark set, guns and the shark but did enjoy the singing and orchestra. I would not dream of booing a production and only after the cast came out with their supermarket bags and waved the fish about I felt I could take no more and left before Act 3. I will continue in my aim to engage with opera though, I find it all a learning curve and I am sure i will find something that I like. If booing is allowed, is it ok for the audience to sing along? Mosh? Bottle the stage to show disapproval? How about allowing the cast to crowd surf. It's one thing to be at a festival or rock arena event, this is something else. I agree a stony silence would be just as effective and not so offensive to those who may like it, wish to hear it and have the right to do so having paid for a ticket. That's Idomeneo? It looks more like Dreigroschenopfer: "Und der Haifisch, der hat Zaehne..." ! The trouble is that with Idomeneo, the directors and designers did not appear to have done anything apart from sit in the pub for six weeks. There was no concept, no regie theatre - that would have been better. All the director could think of to do was to put the chorus in the pit and leave the singers by themselves onstage to sing some very long arias - as if a concert performance. The set designs were just plain white and black flats lit in pretty colours occasionally, and the costumes were from BHS. If I had paid up to £200 to see this I should have, rightly, booed at the end!!! It is only fair to say that musically, the opera was (in all departments save one) up to ROH's usual high standards: so a concert performance in anything but name. I'd love to know how much the director and designers got paid - to do nothing!!! I have been going to Covent Garden since 1957 and have only bothered to boo once although I have often wanted to in recent years (and at Glyndebourne). It seems to me that many of the directors and designers are self-obsessed "artists" on ego trips who have no regard for, and, perhaps, little knowledge of, the libretto and music. What dimwits engage them and pay them and why?But then the venue is now bars and restaurants with some opera tacked on. I really hated the booing at the recent production of Idomeneo, although I thought the modern dress, the attempt to make a political point and the substitution of the tableaux for the ballet did not work at all. The singing, though, was wonderful and it was the singers who bore the brunt of the booing. There are other ways, as now, to make one's point. There was no booing going on at the performance I of Idomeneo I atended, but I suspect that was purely because of outstanding singing, especially in the last act. But I have to say I cringed and suffered at the sights on stage, and would have happily booed if it wasn't for my respect for the incredibly talented singers. Tickets are getting more and more expensive (£250 for Manon Lescaut last season) and the audience have a right to manifest their anger (if you care about opera as much as I do) and dissapointment. Having attended the ROH fairly regularly for a number of years, I have with very few exceptions hugely enjoyed the music. However, following a number of infuriating productions a few years ago I got so fed up that I cancelled my Friends membership, (now renewed it but am much more careful about which operas I attend). I do still wonder however whether Directors wil ever learn that the production must never get between the audience and the music. Idomeneo was offensive and deserved to be booed. I did not take part as I walked out at the interval. This is an opera that has not been seen at CG for over 20 years and I was so looking forward to it. What an awful production and a great disappointment. Musically it was great but I did feel; sorry for everyone having to work with that. I hope the rumours that the same team are going to direct the new Tito at CG are untrue. No way will I spend money on anything that they direct. I was not at the opening night (saw the second performance) so could not show my feelings about this ill-thought out production. It is Mozart's opera not some producer who has to be different and completely against tradition. Also, in these times of financial restraint why was it necessary to employ 27(?) actors when some chorus members would have been capable of wearing black and carrying guns. As for the shark and the children...! I am not saying do not innovate but respect the composer. I have been attending at the ROH since 1959 and have rarely booed the production team, but I thought the production of "Idomeneo" was fairly terrible. Why did Arbace wear a bobble hat and carry a piano accordion? The final scene was a completely missed opportunity, with wonderful ballet music being played superbly, while the audience watched boring tableaux of people looking dejected. When the production team take a bow they have to take what's coming. The production should always aim to support, illustrate, clarify what is in the score. It's not there for the producer to set a different agenda. The producer's first duty is to get to know the work properly. A bad production makes the performance so difficult for the singers, and the ROH has excellent soloists and chorus. Booing a production from yet another arrogant "what this opers is really about"
Director is completely justified. I've paid good hard earned money after all. But if only Mr Holten would take notice!!! Vox dei and all that. I appreciated the director's idea for the production, while feeling many aspects were misconceived (the crowd waving around their fish was particularly risible). But my feeling of enjoyment from most of the musical aspects was swiftly terminated when people burst into boos at the end. Sitting on your hands when the production team come on is a perfectly effective message. And as for this new fad of booing 'villains' after a serious opera, do we really have to behave like the panto? I was at the first night and was extremely disappointed. All the performers, the orchestra and conductor were applauded. It was only when the director and his cronies came onto the stage that the booing happened. I did it to show my frustration at a wasted evening. To Boo or not to Boo is not an option. I will always applaud the singers and chorus for their efforts it might not be always be rapturous, but yes they should thanked. As for the production team, a completely different matter, how else can one show your lack of enthusiasm for their misguided efforts. Yes to remain silent is a polite option but with people clapping and cheering around you doesn't really count for much. So I say by all means BOO the curtain call of the production team on opening night and if they dare come out during the run, which doesn't happen often, give them an earful then. I've seen to many director productions that should never have got past the drawing board stage. House Managements now seem to scared to get involved and to say no or even question the logic of a director's ideas, authors do at least have editors. So YES I will continue Boo a production I don't like and I certainly won't buy tickets for its revival. In my long history of operagoing, mostly at the Met in New York, I've booed twice, and that was many years ago, for singers (not producers) who were consistently not of the quality I expected in a professional opera company. In those specific instances, because I couldn't enjoy the performances, I felt someone needed to take action! And I wasn't the only one. In such extreme cases, I think it's not enough to sit on one's hands, because most of the audience will applaud by habit, in order to be polite. The singing at the ROH is generally outstanding, the orchestra sublime, the productions often dire . So what do I do? Simple, close my eyes & let the music and singing enthral me. ve it. I can only once remember a famous Amrican soprano who had a bad evening and th booing was most unfair. I just didn't clap.But hoe does an audience show its dislike ? Some years ago after one act of a dreadful production of Aida, someone shouted." Hang the producere" to which there were many "hear hears." I have to confess that I am not able to bo even when , as I guess it happened to many in the first night of Idomeneo, I may be ... mad...with what I may see in the stage. But I do understand those who are doing it, in face of what is being presented , as an example , in several opera productions of the ROH. And in other opera houses. I also confess that having already had one experience with a production of Martin Kusej in Salzburg, years ago, and after reading what was written , in the April edition of the ROH Magazine, about this production, I decided not to attend to any performance of the opera. And it's clear that I was right. Apparently, "we" had Mr. Kusej's Idomeneo, not Mozart's. But, also apparently, on what concerns the music. Many already wrotte before, and in a much better English, what I do think about what these directors are doing , for years, to Opera. For me , real crimes. Cultural crimes. I do hope not to have to decide to stop travelling to London to attend to this type of productions at the ROH, that are increasing in number . And my idea, as other already wrotte, is that this is not bringing more spectators to these opera houses. These awfull productions will have as consequence a decrease of these numbers. I intend to attend a performance of John Copley's production of "La Boheme", that will have it's last performances. I am already afraid of what will replace it.... . But what should simply be forbidden, is to do what was apparently done to Idomeneo. by the director. Booing at the end of a performance or silence is justified if the performance is a disappointment .In my experience it mainly occurs in relation to the staging and not the singing or playing.We pay a good deal for our tickets and are intitled to express our opinion especially if the staging adds nothing but confusion to the understanding of the oprea. In many instances it is a total distraction and often ridiculous.I I have been an opera goer since 1970 both here and several other cities where I have lived. Booing is as justifiable as applause and shouts of bravo/brava/bravi - especially if this happens after an aria and disrupts the opera. Good riddance to bad rubbish production, especially many of those we have seen the last two years - most, if not all richly deserved to have the production team booed. My wife sometimes accuses me of nodding off at Covent Garden but in reality my closed eyes allow me to enjoy the consistently good singing and splendid orchestral sound without being upset by the 'visuals' - I fear that I won't see too much of Idomeneo at my visit next week. I'm all for booing if the culprits appear on stage but otherwise resigned acceptance of the production and applause for the singers seems politer. I'm the same - quite often listen with eyes closed as the staging is trying to shove a 'message' down your throat which dumbs down the work itself. I see no reason why not to boo as it is merely a means of providing feedback as much as applause. However, I have never thought of booing a performer as I value their work but I have booed productions and I feel the rise in booing at CG is merely becuase there is a rise of productions that are not what the majority of customers want. We should boo first and then if things don't change we should withdraw our custom. I have attended opera and ballet at ROH since the 70's and many seasons by Scottish Opera when they came to Newcastle. Never have I booed a production but have fallen silent when directors have appeared on stage, only to resume applauding when the singers appear. Like many I too am tired of these 'Concept' productions, the music should be allowed to speak for itself. No I do not want 'Traditional' productions, but 'Classic' productions which can be revived by the company, and classic can be modern dress etc if relevant to the story line. Like many I too now carefully select which performances I attend, partly as £500 to attend a performance (I live ion the Highlands of Scotland) is simply too much to waste on a poor night out. I stopped going to Scottish Opera completely when they went down the road of infuriating concept productions which ultimately did the company no good. Come on the ROH look to your past and see how you have dealt with wayward productions, why be simply a copycat company doing what every one else is doing, Your a major International Institution lead the way don't follow. Having sat through some stinkers at the Royal Opera (as well as some of the best nights of my life) - the Czech cat house Rusalka and the Holten Onegin come to mind - I think it is entirely justified to boo the arrogant directors and producers who ruin great art by trying to be 'relevant' or 'different'. I would never boo singers. Suggest refrain from clapping and express opinion by this type of social meda. It's not enough to say that it's boorish and rude. I've seen a few productions recently that have themselves been boorish and rude. A recent production at Cardiff was so inconsiderate of the singers that the woman responsible should never be allowed near an opera house again. Why should they be allowed to get away with it? It's invariably producers of course, imposing their ill considered and arrogant ideas on a helpless audience. It's all too clear that some of them have no understanding or liking for the music they are illustrating. The ultimate sanction, as has been pointed out, is to stop going. It's not Scottish but Welsh in my case, and with great sadness that I no longer feel able to support the company as in the past.Unusually,in the case of WNO, the reponsibility for the awfulness of the least few years seems to lie squarely with the Artistic Director, even more than with his cronies who bungle the productions. Any actor who expects only polite riposte from audiences has not fully understood the nature of the medium. It is ultimately interactive for good or otherwise. I honestly don't really mind booing anymore. It's a bit tedious but it's not during the performance so it doesn't wind me up. In fact if someone boos something I love I'll just cheer louder. But...I am getting a bit fed up of the opposite trait: overly exuberant cheering. A number of high profile singers have turned up at the Royal in recent years and given fairly average performances, but certain parts of the audience cheer them as though they've just cured an incurable disease. I agree that we should applaud people who have given a lot to the world of opera and ballet over the years, but a rubbish performance is a rubbish performance, and you shouldn't bring the house down just because you starred on some tv show or keep up your public profile by wearing expensive jewellery and dating people half your age. I think ultimately that it's disrespectful to the other performers who are more often than not world class, and put in performances that are just as good if not significantly better. So, forget booing...stop cheering appalling performances because you think you love the performer. How strongly I agree with the reaction to Idomineo. I have boycotted my favourite opera this time round . Tristan and Isolde "by Loy". I saw it first time round and hated it. I have seen the Glyndbourne production and loved it so I am not averse to a contemporary production if it is honest, retains the essential elements and consequently allows one to concentrate on the music thereby it retains magic. I was deeply disappointed with the silly Manon Lescaut and the ridiculous Nabucco for example. I am sick of seeing productions in leather coats and clothes I would not put on refugees. There is a case for sensitively revamping opera and there have been good examples but if the present trend under the leadership of Holten continues I shall simply cease to attend CG . I used to almost monthly. I have counted 200 attendances in the last ten years. Now I have only one production lined up and if they make a similar mess of Andrea Chernier that will be it. I shall no longer renew my Friend membership in protest. Please keep up the booing where it is merited - at least it makes the press and how else do you get through to producers and management. 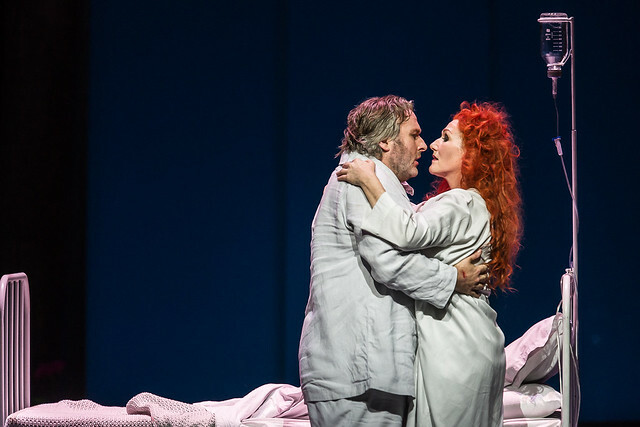 Incidentally have they ever thought that newcomers to opera who will have read up on the storyline and come with an expectation must be completely bemused by what they see and probably will not come again. I analogize it to booing at a sporting event. I would only boo for want of effort. Applying that criteria, I can't imagine booing the singers and I'd think it extremely rare to boo a production, however misguided. I believe that people (including opera producers and directors) try to do a good job. I prefer opera productions that don't deviate far from the opera as written. I thought the Met "Rigoletto" set in Las Vegas an abomination but I wouldn't boo it. What with the ease and expansive width of breadth of social media, far better to express your views there or in a letter or email to the opera company, than to make a public display that says nothing about the reasons for your displeasure. Positive or negative responses are up to the individual. If noisy positive reactions are ok ...then then the contrary becomes ok. Good manners = silence ! The new frequency of booing is simply that many people are not convinced by and do not like many new productions, In the past at ROH there were some much more vocal reactions, even during the performances. They were rare, and generally contested ! The rarity tells a story. Superb singing, chorus and orchestra but totally spoilt by the terrible set,costumes,and visual presentation of the opera. The audience deserved better value for their money. We chose to ignore the reviews because in the past we have thoroughly enjoyed performances that critics have given bad reviews of. Unfortunately we got it wrong for Idomeneo! Mr Holten clearly chooses not to understand that what he interprets as an habitual response to the new is a genuine heartfelt response to the management's habit of putting on dire productions. Is that simple enough? How interesting and imaginative some of these comments are! We as paying audience members (and perhaps with a few artistic views of our own) should obviously have a voice to express our delight/horror at a production. Not wanting to disturb a performance while it is happening, curtain-call time is an obviously appropriate juncture. If we wish to boo or applaud or somewhere in between then we should be able to - it's as simple as that. But I do sympathise with those who resent having a Konzept imposed, top-down, on an opera, particularly if its repercussions create inconsistencies or even absurdities with the text and/or music. I would like to see a production where singers improvise more, based on the text and music, and let a cast interpretation emerge in a bottom-up fashion. There can still be a director to ensure dramatic pace and resolve different viewpoints. 1. Do you really think we are so stupid that you need to 'update' so obviously to relate the themes in an opera to our present circumstances and cultural values? 2. Be careful when deciding what an opera is 'about'. Take the recent Idomeneo for example, which has been much commented on. It is appropriate (in my view) to bring out the right-wing repressive forces that are present, but what about the balance with other themes? For example, love between father and son, and the remoteness of the rulers from the ruled. An unbalanced direction can easily distort the dramatic pace and the way in which we hear the music. In my experience, rarely singers get booed. It is usually the director whose view of a masterpiece is imposed to us with total disregard of the composer's wishes. As such, booing becomes a clear message to the ROH bosses that such awful productions (dare I remember Sir Mc Vicar's Aida?) won't be tolerated. I entirely agree with you. Having seen nearly 100 productions at ROH, some of the indignities imposed on the singers in the name of a new interpretation have been a disgrace. Jonas Kaufman forced to sing in the most recent production of Manon Lescaut standing on a broken bit of motorway for example. I went yesterday to the HD relay of the Barber of Seville from the Met; superbly sung and a lesson in how to produce an opera. No booing for this; even the audience in the cinema applauded. I attended the last night and purposely had not read reviews (I never do until after I have seen something). 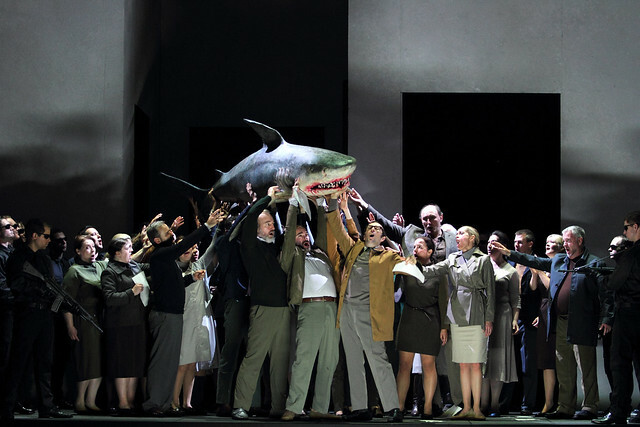 I loved this production and was very moved by some elements of it which have attracted heated criticism from others (I did not find the plastic shark a moving experience I should hasten to add). I felt uncomfortable during the rather muted booing at the end but respect the right of audience members to show their disapproval just as their approval of a production. Personally if I am not enjoying something (for artistic reasons) I stay silent and then rant about it with/to friends on the way home. Or quite often if I am not enjoying something at ROH (where you cant walk out) I simply don't return after an interval but have a leisurely drink at the bar and chalk it all up to experience. I sometimes wonder why those who are not enjoying something stay to the bitter end and then boo. I do always think when it is going on how particularly awful it must be to stand on stage and be booed. How does one distinguish between production and musical performance? Last night I heard/saw "Tristan and Isolde". Musically it was absolutely glorious. The production, however, left much to be desired and one did not have to feel too sorry for those of the audience on the extreme left of the stage who could hardly see anything of the action. Someone in the Balcony slips told me she had been warned and said she had only come for the music. Opera should be a both a musical and theatrical experience. Many Wagner productions are controversial but this one just did nothing. Or perhaps I missed the point? These comments shows that the real debate is not about booing or not booing but about the continuing run of dire productions at the ROH. The recent Tristan is one of them and according to the FT so is Ballo. Does no one in the ROH feel that something should be done about this? To me, booing either during the production or at curtain calls is completely abhorrent! It's disrespectful to the artists who give their all to their art and inconsiderate to the fellow audience members; booing takes those in earshot out of the story and imposes your negativity on others who unlike you may be enjoying themselves. There are other ways of expressing your dissatisfaction (for example not applauding/commenting online after the event) without spoiling the moment for everyone else. But then you cant buy class!